Whether you prefer yours with pork, fish, or cactus (yes, that’s a thing! ), there’s no shortage of excellent taco joints in New York. It doesn’t matter where you are in the state—you won’t be far from a great place to satisfy that Mexican food craving. From the East Village to Buffalo, you’ll find some seriously authentic taco places. Here are the finest in the state. White walls and a spacious seating area welcome guests to Tacombi, a four-location taco chain with a focus on authentic Yucatan cuisine and tortillas cooked to perfection. Al Pastor tacos are the highlight of this East Village restaurant, where pork is slow-roasted to tenderness, and the cerveza and margaritas flow freely. This wildly popular taco joint is tucked away inside Chelsea Market, serving up savory, creative tacos with proteins like cactus and adobada. With a focus on simplicity and quality, Chef Cosme Aguilar crafts delicious Mexican cuisine that has customers lining up outside the door. To try one of their biggest hits, order the beef tongue tacos. This bright taqueria in New York City’s Meatpacking district is popular for its simple menu of fish and shrimp tacos. It also offers ample seating and a bar area. An unassuming Mexican grocery store in Buffalo is home to this hidden gem taco joint, which makes freshly made corn tortillas with simple, high-quality fixings to go. Cool, breezy, and spacious, this riverside taco joint serves delicious tacos and other Mexican fare alongside tequila and dynamite margaritas. This colorful Tarrytown taco joint hits the spot with tacos made of steak, codfish, pork, shrimp, chorizo, short rib, and chicken. They also make their own juices in-house. 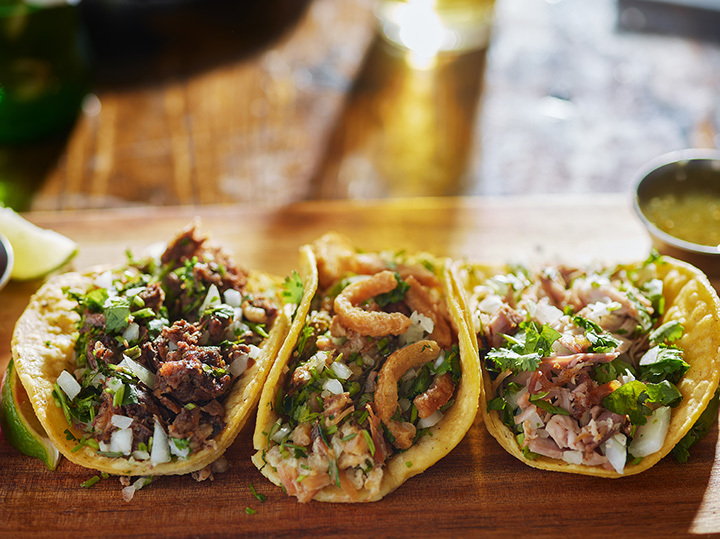 Famous for its bite-size tacos pequenos and its corresponding food truck, Tacos El Bronco serves unforgettable and authentic tacos with interesting meats like tripe. A low-key vibe and a flavor-packed menu define the taqueria that is La Contenta. The taco joint keeps customers coming back for its crispy fish tacos, which are cooked to near-perfection.